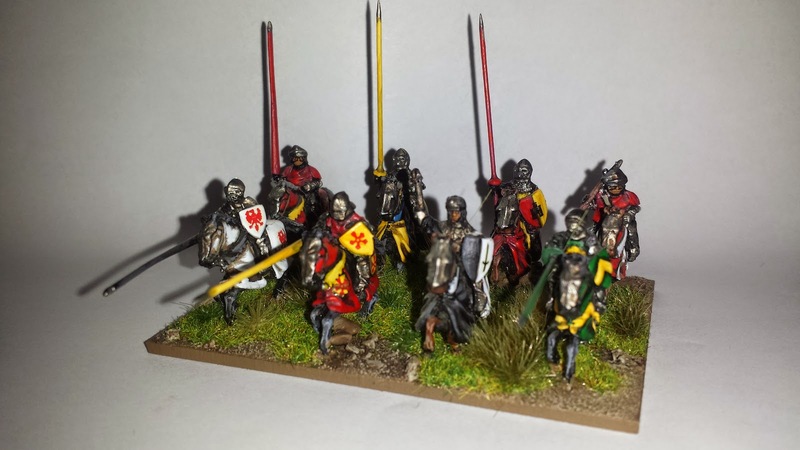 A blog about one british wargamers long obsession with having great ideas, buying far too many miniatures then trying to muddle through and figure out what to do with them all. Well almost, I finished these archers on Wednesday night but didn't find the time to base them. Rather than just show them half finished I thought I'd base them and finish off a loads of basing detail as a job lot. 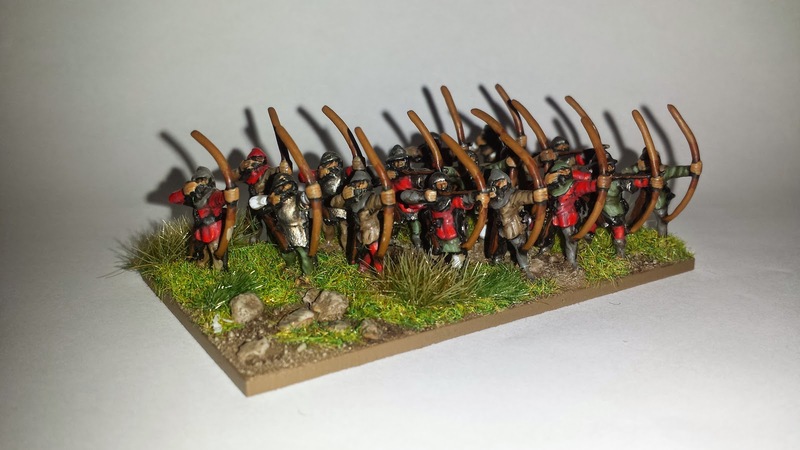 I spent a couple of weeks earlier in the month looking for archers that I liked, many of the 15mm ones didn't have anything that looked like a proper 6' longbow. I eventually came across these figures from minifigs. They're sold in packs of 8 of the same figure and I was after a more mixed up look so I ended up buying packs from both the Crecy and Agincourt ranges and picked up 5 packs, enough for 3 decent sized bases of archers. 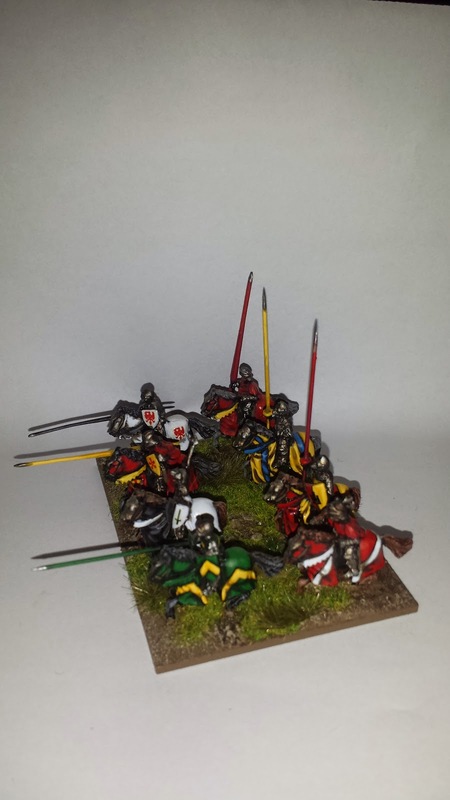 In a similar way to the knights I wanted something to help identify them as English archers so I went with the majority of the miniatures having some kind of red clothing, certainly not uniform but as least distinguishing. I'd tested some basing ideas last weekend and went for a less ranked up look, it fills the base out, gives a little room for dioramas and shows off the fronts of the miniatures a little more. I've recently moved to using graveyard earth (or what ever the new name for it is) as a base for dirt. This is mainly as its quite neutral and I can use it for pretty much anywhere in the world. 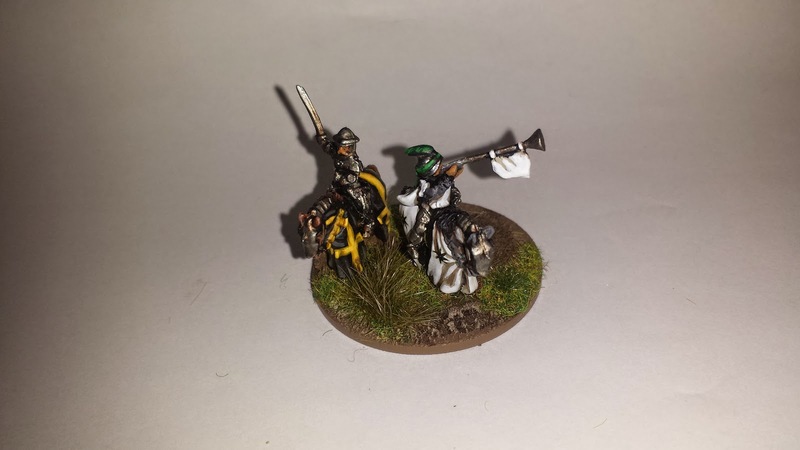 European bases get more green verdant grass whilst middle eastern or African miniatures get sparcer dried grasses. I used a spring static grass and mixed in a load of mininatur tufts to break up the ground a little. Not quite as nice as my brothers bases but will do for me. Next up, either more archers or I may paint up a couple more pulp miniatures. Not sure yet. Anyhow I'm off to Vapnartak show in York tomorrow, not really after anything in particular just for a wander. Wow, you're on a roll. Looking good, but do you think you'll get bored by e umpteenth base of archers?